During her month as Light Work Artist-in-Residence Sonya A. Lawyer worked on three different series. Among them, Southern Roots: Black Madonnas-Black Magnolias, a three-part series that explores and preserves places and memories from her father’s home state of Mississippi. This series includes three distinct bodies of work: The Absence/Presence, Rupture/Rapture/Rest, and A Folk Modernism. She also developed a new part to her series Searching for Beulah (limit of disturbance), which transforms vintage images of African Americans into colorful abstract fabric pieces (referencing quilt patterns used in The Underground Railroad). The newer addition to this series uses vintage images of children and is called Searching for Beulah (and the illusion of our separateness). When Lawyer was not working in our labs, we steered her toward area antique shops to help in her quest for more vintage photographs. By representing images of people of color that appear fastidiously dressed, coiffed, and determined, she works to efface negative stereotypes—such as the lazy inept “Beulah” figure—still used as historical references in popular culture. She believes her imagery can empower others to search, find, and preserve familial images that are uplifting and empowering, and therefore, speak to our collective histories. Lawyer holds a BS in Biology from Howard University and an MFA in Creative Photography from the University of Florida. She has exhibited in Baltimore, MD; Washington, DC; and New York City. She currently lives in the Baltimore-Washington corridor of Maryland. A legacy of cultural preservation is evident in the art of Sonya A. Lawyer. Her combination of turn-of-the-century photographs, quilting, and technology, by way of digital imaging, help Lawyer accomplish this Herculean effort while simultaneously speaking to the past and present state of cultural production. Mining history, visual and material culture, and literature, she inserts her voice into the ongoing dialogues surrounding the invisibility and voicelessness of African Americans. She does this by exploring family photo albums as well as anonymous photographs. As a starting point, Lawyer incorporates her family history into the larger discussion about past lives. Working from her personal vantage point, she adds vintage photographs depicting anonymous people. Although the subjects of these images are unknown, their portraits speak to Lawyer, an artist clearly attuned to their spirit. With a determined spirit of her own, she visually comments on her history, their history, and our history by utilizing African Americans in her layered vision. The series "limit of disturbance" represents Lawyer’s artistic eye for seeing the beauty in the everyday. Where others may view the unnamed and unidentified as ordinary or mundane subjects, Lawyer creatively elevates the people in these photographs to a level of distinctive respect. Her work is about the people just as much as it is about the photographs, history, and material culture of African Americans. 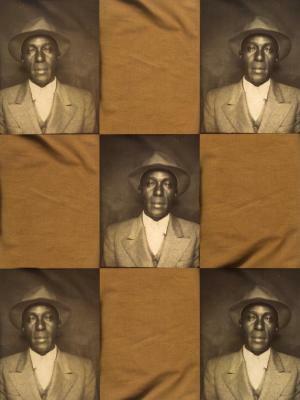 Individually, the photographs stand on their own representing African American culture. However, the combination of the photographs and quilts adds a narrative element that references one aspect of the African American quilting tradition. Lawyer’s art memorializes the tradition of including photographs within the quilt format, and features portraits, whether in painting, appliqué, or photo transfer. The work leads you to ask questions or piece together a story, looking at who the person was, why their photo was taken, and the subject’s life and legacy. Although we do not and may never know the story of the sitter, we can infer what their lives, hopes, and dreams may have been during the era of uplift at the turn of the century. The photograph then, as is often the case today, was a way to construct and assert a person’s identity. Studio portraits accomplished this because sitters could don their finest clothes and present themselves in the best light. In employing the studio portrait, the sitter and the collection of photographs Lawyer combs counter the stereotypical and caricatured visual images of black Americans at the time. Lawyer’s excavations, coupled with cultural traditions, exemplify the ability of art to speak across and transcend time. Lawyer, as a cultural custodian, continues a legacy of creating art that is relevant today and will resonate in the years to come. Lawyer also continues a tradition started by W.E.B. Du Bois in collecting, and in essence, archiving the visual culture of African Americans. She pays homage to the anonymity of the people and to the material contributions of quilting. The final product represents a memorial to a time and life lived. The melding of the people and the quilt signifies the cultural and societal contributions of African Americans to the fabric of a country that so easily forgets their names. Lawyer reminds us to never forget our past. Sonya A. Lawyer currently lives in the Baltimore-Washington corridor of Maryland and teaches photography at the Art Institute of Washington. She participated in Light Work’s Artist-in-Residence program in August 2007. Her work can be seen at http://www.sonyalawyer.com/. Jeffreen M. Hayes is currently pursuing a doctorate at the College of William and Mary. She is an art historian, curator, and arts writer.